DJ Swykert, welcome to Romance Lives Forever. 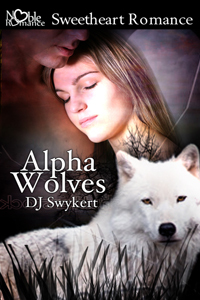 Let's talk about your book, Alpha Wolves. Maggie Harrington is torn between her powerful and passionate love for Tommie Stetter, and her deep and affectionate love for the abiding Jeremy Paull. Having to choose between them is testing her beliefs and breaking her heart. Maggie Elizabeth Harrington, twenty-three, schoolteacher. Tommie Stetter, twenty-six, mining captain. Jeremy Paull, twenty-six, copper miner. I am looking in the mirror at a guilty person. I see a face that is happy on a day that it should be sad, and I am feeling guilty about it. 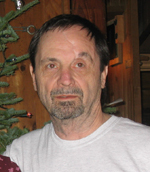 Today James Stetter is going to be buried, and I am feeling happy. I have not liked him for a very long time; he took something away from me that I have been unable to forgive him for. It has been ten years since I have seen Tommie Stetter and looked into his beautiful brown eyes that glisten, that enter into me where I want them to be; and know me, Maggie Harrington, for who I really am. So, even on this sad day, when they are going to bury Tommie’s father, I am happy. I am going to be sitting once again in church with my beloved Tommie, but I feel guilty about it. I look again at my face in the mirror. It is the same face, the same blue eyes that loved Tommie Stetter with all her heart when she was thirteen. I am twenty-three years old now, but I am the same little Maggie Elizabeth Harrington. I am a little taller, and my bosom is fuller, my hips are not as straight up and down, but I am the same, I am no different. I still live here in Central Mine with my father who works deep under the earth digging copper. I am a teacher’s assistant at the Central Mine School. I teach the first three grades, and I like teaching little children; they are pure, their minds are not as cluttered with things as adults are. So, unlike many of the people here in Central Mine, I am at least satisfied with my life, if not completely happy. Ten years ago, when Tommie was sent away, I was sure that in two years when he finished school, he would return to Central Mine to work with his father as a mining captain and we would be married. I lived with that dream for two years. I walked with Tommie in my head, I talked with Tommie no matter where in the world he was, I was still with him; we were together. But, two years later, I learned from my best friend, Annie, Tommie’s sister, that he was going to stay in the East and continue his education, he was going to college. But I am a very determined person, and I still believed that Tommie, my true love, would come back to me. I never gave up that dream. I never left the dream world that Tommie Stetter and I lived in, and I don’t think I ever will. After graduating from high school I began to assist Mrs. Daume with the younger children. Eventually I was allowed to teach them by myself, and I have been teaching the first three grades ever since. I felt very fortunate, and I really liked Mrs. Daume. She continued to help me, taught me all kinds of things about literature and philosophy. I liked learning about people like Plato, who spent their whole lives thinking. After all, I believe that I have spent my whole life either thinking or dreaming. I felt I had a lot in common with Plato, who spent so much time thinking and talking about things like truth. In addition to teaching at the school Mrs. Daume was the organist at the Central Mine Methodist Church. Nothing much has changed in the church. Reverend White is still there, and still preaching his sermons with great fervor, the sweat rolling off his temples, his voice screeching through the air, and all the people listening and saying “Amen.” No, nothing much has changed at the church. But a lot has changed at the mine. About the time that I began helping Mrs. Daume the mine began to fail. The veins of copper that could be found were very deep, and poor, and you would hear a lot of miners talking about how they couldn’t make any money. The ore was poor, and they were mostly just digging barrel copper to be stamped. Then, in the fall of 1899, the Philadelphia Mining Company announced they were going to pull out. It wasn’t worth their investment, the return on capital simply wasn’t worth it. Central Mine was finished, going to be closed. There were many meetings, and lots of miners soon left Central Mine. Officials came out and closed down the office, and work came to a halt. The winter of 1899-1900 would be a very dark and cold winter. A very frightening winter as the miners looked at their future. The mine had been operating since 1863, and up until now had always been profitable. But it was also very remote, and quite a few miles from the other mining ventures that still operated on the Keweenaw Peninsula. Of the mining families that had settled here, many of them knew little else. Many of the later arrivals, the French, and Italians, left, but the Cornish teams that had been here the longest, they were the most settled, these were their homes and they wanted to stay. When James Stetter offered to reopen the mine under his own direction that spring the Cornish miners welcomed his offer, and work began that summer to pump the water out of the shafts and put in fresh timber. Mr. Stetter was respected and well liked by the miners. They worked hard, everybody remained in good spirits, and they began that fall to bring small amounts of copper to the surface. But the ore was not rich, and despite further exploration, they were unable to discover any large new veins. For the last three years half of the miners worked old shafts that still produced some barrel copper, and the money earned was shared with James Stetter to finance the exploration for new and richer veins by the other half of the miners. Things were not good, but everybody worked, and life managed to go on in Central Mine much as it has for the last forty years. Monday through Saturday under the earth, and Sunday mornings at the Central Mine Methodist Church listening to Mrs. Daume play the organ, the choir sing, and Reverend White preaching his sermons. I have been busy teaching children; doing the chores, and cooking dinner for my father, who was just as silent as before, just as quiet and hard as he has always been, but somehow it wasn’t as important to me anymore. I was happy working at the school, and dreaming of Tommie Stetter, knowing that someday he would come for me. “Maggie, are you ready? It’s time we walked up to the church,” I hear my father say from downstairs. It made me feel no different than I had those many years ago, when either he or my grandmother called. I looked at my guilty face in the mirror once again. Yes, I did feel guilty, but I was also happy. It has been so long since I looked into Tommie Stetter’s brown eyes that glisten, I couldn’t help it. I was sad, but happy, all at the same time. I find that so strange; I never have understood how I could feel that way. But that is exactly how I am feeling this Sunday morning as I prepare to walk over to the church and listen to Reverend White speak about James Stetter. We will all pay our last respects, and then follow the pallbearers as they carry the coffin to the Eagle River Cemetery for the burial. And I know that at some point get a chance to see Tommie. I will get to look him in the eyes, and he will look at me, and we will know where we are, where we have been, and where we are going. I will know that my waiting was not the foolish daydream of a schoolgirl. That what passed between Tommie and me ten years ago was real. It was as real as all the things that I dream about, and all the things I believe in, and all the things I live for. Today the village of Central Mine is a ghost town, with just a few houses and the church left standing. In 1902, when the story takes place, it was a thriving community of about 1500 mining families, a store, a school, and of course the mine. Central Mine sat on top of a hill on the Keweenaw Peninsula in the northernmost tip of Michigan’s western upper peninsula, it was over twenty miles through the rugged country to the nearest small city, Calumet, which is still thrives today. My father told me about a strange woman who lived across the street from a house my grandfather had in Central Mine that was used as a hunting cabin. She was a recluse with wild white hair and a known eccentric who wandered the countryside during winter and summer, ultimately found frozen to death one winter morning in a clump of birch trees. Very little was known about her, and what made her so eccentric. I built a fictional story around her, and included wolves, as I had raised a pair of them and they were indigenous to the area. Jeremy Paull, because he is a man’s man, but a woman’s man as well, honest, strong, and with integrity. He is the least flawed of the characters in the book, all who are good people, but fall into some situations that entrap them, cause them to act in ways that contradict with the kind of people they are in their core. Because in fiction conflicts end the way you want them to, not as in real life as they sometimes have to. Without a doubt my girlfriend Donna, she is my editor and partner. And I believe good editors are essential to good books, editing is a skill set just as important as writing. I’m going to have to go with the coffee, uh… gorgeous “hunks” don’t do much for me. Perhaps in the kitchen, I like to cook. Cajun food is my favorite, I have my own secret Cajun spice. My signature dish would be blackened Cajun Roughy with a lemon parsley gremolata. I’ve also been known to watch a little football. Neither, I’m a ponderer. I think about a story and the characters for months, maybe scribble a few notes. And I always have the ending in my head before I begin. Then I put my characters into situations and the chapters resolve the conflict but always point towards the ending I already know. Sold it for millions. I had a big agent for the very first book, the prequel to Alpha Wolves, which has been in print twice, once as Maggie Elizabeth Harrington and published a second time by a now bankrupt publisher under the title The Place Between. I think it’s a good story, the agent got it read by many major publishers, but it was declined, they felt it was too regional to ever become a major bestseller. I think they’re wrong, and in today’s global publishing world, a regional story about a young woman and her boyfriend trying to save a pack of young wolves from a bounty hunter can attract a reading audience. But of course that’s my opinion. I hold the rights to the book and one day it’ll resurface again. If I’ve learned anything about life it’s that it tends to repeat itself, it’s all about duplication. Irregular, but I favor mornings, I’m not as sharp after lunch. True. My best writing seems to be early in the morning. And I don’t think you can write good prose by spending too much time each day at it, your brain tires and your prose does with it. There’s a little bit of the author in every writer’s characters. I’m no different. And art does imitate life, we all draw from experiences and change the facts, and that makes it fiction. I believe in animal rights. If you think about it, they lead miserable, cold starving lives. That’s why I feed feral cats, or anything actually. There’s a possum that comes to my back stoop and eats food I put out for the cats. And that’s good with me. I’d like to write a bestseller that brings the treatment of animals to the attention of the general public. I was a logistics analyst and operations manager in transportation, and later a 911 operator for a decade. They’re all hard to write. There’s no such thing as an easy book. I take solace with the thought that If it’s too easy it probably won’t be very good. I believe in coincidence, as the Hindus say: Given enough time, it’s inevitable. Same kind I listen to most of the time, Classic Rock. Favorite road tune: Bob Seeger, Roll Me Away. I'm always ready for football. When I'm alone, I am alone. You'd never be able to tell, but I’m a softy. If I could sing I'd have been a musician.